Ranked among the top sports cars of its time, the 2018 Chevrolet Corvette received an overall rating of 9/10 from the US News Scoreboard. The speed monster comes with a powerful engine, refined interiors, and high-tech features, all coming together to deliver truly breathtaking performance and experience. If you wish to own a sports car but have budget constraints, participate in the online car auctions held at SalvageBid.com Continuing on the subject, in this blog, we cover some of the highlights of the 2018 Chevrolet Corvette. Take a look. Timeless styling and breathtaking performance are two expressions that perfectly describe the Corvette legacy and the 2018 model is no different. The 2018 model features the uninhibited use of carbon fiber, with the material being used to fabricate a number of components including the trim, spoiler, and front splitter. The side rocker panels and rear diffuser give the 2018 Corvette a raunchier appeal compared to its predecessors. The 2018 Corvette also features a Bi-Xenon HID headlamp that gives it a more aggressive appeal than the older models. All trims feature rear intake vents to cool the rear differential and transmission oil. If you are looking to buy repairable cars for sale and this speed demon with looks to die for certainly deserves some love. Rated 8.4 out of 10 by the U.S. News Scorecard, the interior of the 2018 Corvette is tastefully finished with premium quality leather upholstery and also features the evident use of carbon fiber. The 2018 Corvette has a driver-oriented cockpit and the highlight of the cabin is the plush automatic seats with 8 adjustment options, coupled with generous lumbar support. All three trims have GT and Competitive seats available in premium Nappa leather. When it comes to cargo space, the standard models offer 15 cubic-feet and the convertibles offer 10 cubic-feet. The 2018 Chevrolet Corvette is available in three engine options: Stingray, Grand Sport, and Corvette Z06. The Stingray is equipped with a 6.2-liter V8 engine that produces 455 horsepower and 460 lb-ft torque. The Grand Sport is equipped with a V8 engine that produces 460 horsepower and 465 lb-ft torque. On the other hand, the Corvette Z06 is equipped with a supercharged 6.2-liter V8 engine that produces 650 horsepower and 650 lb-ft torque. All three engine options offer a standard 7-speed manual transmission with an optional quick-shifting 8-speed automatic transmission. 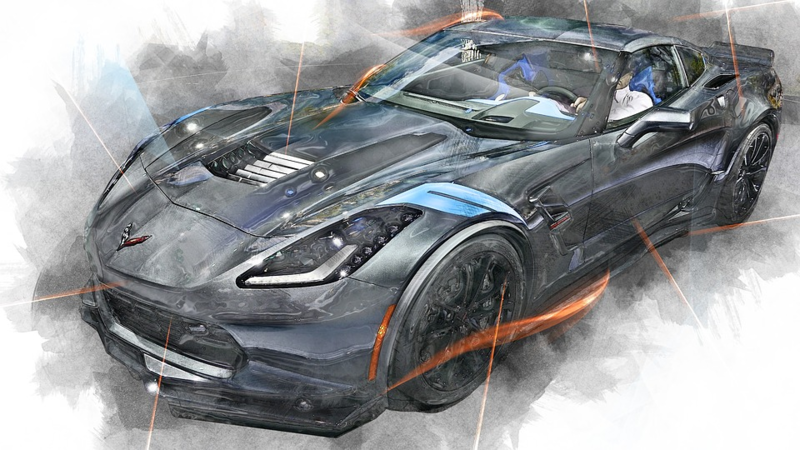 The Stingray, Grand Sport, and Z06 can go from 0 to 60 in 3.7, 3.6, and 2.95 seconds respectively. Browsing Online Car Auctions? Look No More! The 2018 Corvette continues the legacy its predecessors, offering impressive, flawless design and breathtaking performance. If you wish to own a Corvette but have been restricted by your budget, check out the repairable cars for sale listed at SalvageBid.com If you have any questions regarding our online car auctions, simply call +1 (360) 347-1300 or fill out our contact form and we will get back to you, shortly.